Bonfires were lit in several areas of Belfast at about 10pm on Wednesday evening to mark the 41st anniversary of the introduction of internment without trial in 1971. The Six-County government has moved to suppress the bonfires, which have become associated with the ongoing internment of ‘dissident’ republicans. Trouble quickly broke out between the PSNI and local youths in a number of locations. Rioting broke out in Belfast while there were also serious disturbances in Banbridge, County Down. Some of the worst rioting broke out in the Divis Street area of west Belfast, where petrol bombs were thrown, but there was also trouble in New Lodge in the north of the city and at North Queen Street. Trouble was also reported in the Stewartstown Road area of west Belfast. In some locations, burning barricades were set up, while fire crews, tasked to extinguish the fires, also came under attack. A total of six were arrested in Belfast, and two more arrested in Banbridge. They were charged with obstructing police, rioting, and resisting police. West Belfast Assembly member Fra McCann condemned the bonfires. “Young children who collect the wood have been encouraged to do so by older people in the background and these people need to come forward and explain what good the bonfire does for the area and its people,”he said. “I was interned twice and as a former internee these bonfires certainly do not represent any marking of that time in our history. Fellow Councillor Conor Maskey, who organised the removal of bonfire material from the area a number of times in recent weeks, blamed republican hardliners for the trouble. A banner bearing his name was reportedly hung from an anti-internment bonfire in New Lodge. “Their only contribution to life in the New Lodge is destruction, facilitating attacks on republican ex prisoners and giving young people criminal records,” he said. 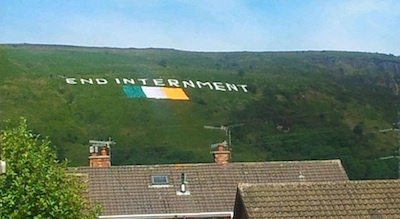 The following day, the James Connolly republican society in Belfast called a protest against internment on Black mountain, in which a giant ‘END INTERNMENT’ sign was erected on the mountain overlooking the west of the city. A similar protest, against the royal visit last month, was attacked by a loyalist mob. “Internment 21st century style is not only still in use, its use is now much more draconian than at any time in the past or in any other country in the world,” the group said in a statement. “The present day English administrator, Owen Paterson, not only deprives Irish citizens of their liberty without recourse to a judicial process. In the cases of Marian Price and Martin Corey this administrator has also over-ruled the decision of two high court judges who decreed that they had no charges to answer and should be released immediately.